VIRUSES? - HELP US HELP YOU! _________________________________________________________________________________________ | Computer Arts, Inc.
Malware: Malware is short for malicious software, meaning software that can be used to compromise computer functions, steal data, bypass access controls, or otherwise cause harm to the host computer. Malware is a broad term that refers to a variety of malicious programs. Common types of malware; adware, bots, bugs, rootkits, spyware, trojan horse, viruses, and worms. Spam: the electronic sending of mass unsolicited messages. The most common medium for spam is email, but it is not uncommon for spammers to use instant messages, texting, blogs, web forums, search engines, and social media. Adware:software that displays unwanted advertisements known as malware. 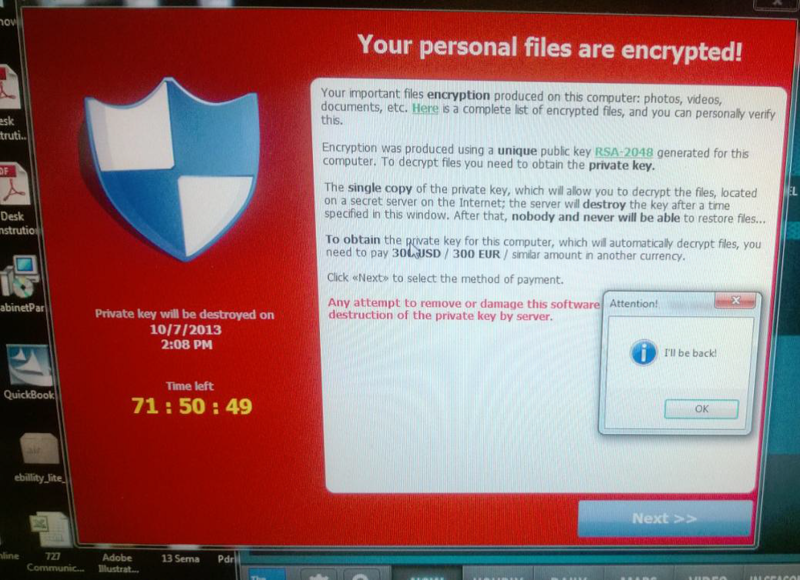 There are dangerous virus/ransomwares that are hitting many customers. Even the State of Idaho Tax Commission has recently sent out communications warning users to be cautious. The virus can come in through users clicking on email attachments that are actual viruses or through attacks that utilize exploiting other avenues. The attack then installs on the system and begin to attack and go after its real payload: Your key data files such as pictures, documents, financials, memos, emails, videos, music etc. It will often search for any Office (doc, docx, xls, xlsx, ppt, pptx), database (dbf, adb, mdb), picture (jpg, tiff, gif), adobe (pdf), video (m4a, mp4, wmv, mpg) audio (mp3, wma, aac) file and encrypt it. It will also search across a network for any file across the network that is also an Office or Database file and encrypt it as well. It often shows a message on the screen asking for payment to decrypt the files. DO NOT CLICK ON OR INTERACT WITH ANYTHING ON THE SCREEN! If you see such a popup, hold the power button in on the pc until it shuts down (around 6 seconds), or just pull the power plug out of the wall or PC to shut it off. It will do much less damage than if you interact with the sometimes scary or official looking popup showing on the screen. Once you click, move, try to close the popup etc, the payload has been delivered and the process of encrypting, destroying or otherwise wreaking havoc on your data files has begun. This is called social engineering. The hackers know you will react and want to close, move or get rid of the item on the screen, just as you normally would. They are counting on you reacting to their prompt. Once your files are encrypted or destroyed, the only real remedy is to restore from backups, if there are any, otherwise your data is lost. Besides the loss of data, there are several DAYS of down time to the user and organization which can easily equate to thousands of dollars in loss of productivity. Not to mention the hours and days of time spent by IT staff searching for the infected files, deleting the files and restoring from backups. A simple, inadvertent, inattentive click of the mouse can cause massive damage to your data, network and company. Please be attentive while mousing and don’t get click happy! Be aware of misspellings in emails or webpages (i.e. Microsoft vs Micorsoft or Microsft) and logos that don’t look quite right, DO NOT OPEN or CLICK if you see such things.